How does your identity relate to your work? I’ve worked as a counsellor/psychotherapist for over twenty years, in a variety of settings and organisations. I’m passionate about challenging stigma around mental health generally, as well as the impact being LGBT+ has on a person’s mental health and well-being. I identify as a trans man and I’ve known about my gender identity for many years. But I felt unable to be authentic in both my personal and working life through fear of prejudice and non-acceptance. I eventually went to see my GP at the age of 46 and began my transition with a referral to the gender clinic in Nottingham. I’ve been taking hormones for the last 18 months and have recently had my top surgery. I moved to North Wales two years ago and came out as transgender during the interview. Someone on the interview panel was wearing an NHS Wales rainbow lanyard, which gave me the confidence to be authentic. So, I made the decision to move from England to Wales as Jack and spend the rest of my life being my true self. My line manager and team have been extremely supportive and accepting and have been very open to finding out more. I’ve been able to ‘normalise’ what it means to be transgender and talk about gender identity in an open and educative way. This has enabled me to challenge use of incorrect pronouns, stereotypes and assumptions. Being authentic has changed my life completely – living my life as Jack has enabled me to not only love myself but also be loved by others. By being authentic at work, I have a deeper connection with and better understanding of myself. It’s had a really positive effect on my well-being, both mentally and physically. And it’s enabled me to feel a much stronger and deeper sense of self-worth and confidence. Are you involved with the LGBT network at your organisation? I’m a member of our LGBT+ support group, Celtic Pride. 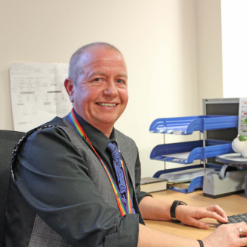 Through that I’ve had the opportunity to speak with the health board’s chair, executive team, and staff more broadly about what it means to be transgender. I’ve been involved with supporting trans staff members to come out at work and hope to develop a trans buddy system soon. Through the network, I’ve also become involved in other community projects, young people’s groups and support organisations in North Wales. I’ve been involved with developments to the Transgender Pathway in NHS Wales and I’ve been able to link with local organisations, like prisons and universities, to offer my support in raising awareness. Why are workplace role models important? Role models help to challenge prejudice, ignorance and pre-conceived ideas. They help to normalise and also give people the opportunity to make contact and ask questions. I’ve had contact with other staff who are questioning their gender identity at my organisation and have been able to model that it can be a safe and positive place to work. I received Stonewall’s Trans Role Model of the Year award in 2018. Since then I’ve had opportunities to talk at conferences and within my place of work to raise awareness – the visibility has been a really positive experience for me.